Fat and Happy Blog: Himalyan Pink Salt & Black Pepper Cookies! Himalyan Pink Salt & Black Pepper Cookies! One of the great 'strange ingredients' that was in my mailbox not long ago was Himalyan Pink Salt, and yes, it really is pink as you can hopefully tell in the photo to the right. It's quite pretty actually, which made me think about how best to utilize and show this off flowery fashion. I did do a little research on this pink salt and what I found is that is a fossil marine salt and is rich in many minerals including Calcium, Magnesium, Potassium, Copper and Iron. In ancient times, the Himalayan people used this salt to keep fish and meat all year long. I have to wonder if this is why curing salt is now colored pink? Every salt out there is it's own flavor profile and there are many salt fanatics that could do the blind taste taste - similar to a wine sommelier, I guess that would make them a salt sommelier, strange- in any case, I am not one of them. But that is not to say that ordinar y foodies like myself can't have fun with this delectable mineral! Whatever I made had to stand out, I knew the salt needed more showcasing than just mixing it in. I have three recipes, all centered on baking. Chocolate cookies, lavender wine cookies and bread sticks! Look for a pretzel recipe coming soon too! 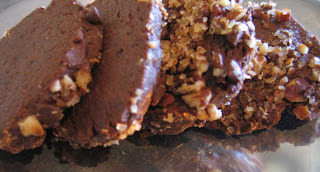 Today I'm talking about the chocolate cookie. I started with basic chocolate cookie that I adore, it's a black pepper chocolate cookie to be exact. I really wanted to match the saltyness with a sweet balance and I thought the spiciness of the black pepper would be a good mix as well. The results? Truth is that the salt is not needed. It's a great cookie by itself, and the additions of the nuts and chips, were good, but unnecessary; then every few bites you get a hint of salt that was an interesting combination but also left you wondering if it was meant to be or if perhaps the dough was not stirred enough. Overall, make the cookie because it's a fabulous cookie. Divide the dough in half and then coat the cookie with and without the salt and you make the call. Looking back, I think what I had in mind was a salt and pepper cookie similar to the salt and pepper potato chips that I have uncontrollable urges for now. I will try this again, but I'll use a plain white/vanilla cookie as the base instead of chocolate. If you're a salt diva then you'll probably love these. If your not a big salt eater, then look to the Lavender Wine cookie as this will be more to your liking and they are simply fabulous! Either way try the pink salt, have fun with it, use it on something strange like ice cream or cheese...go ahead, try it and be fat and happy! Now slowly add the sifted dry ingredients until mixed. Scoop the dough out onto parchment paper and roll in to a log - it will look like a bit tootsie roll! Now I find it easier to roll into my ingredients while it's still soft before placing into the refrigerator. You can wait if you want, what ever you find easier. Roll into sugar and black pepper, or roll into chopped pecans, mini chocolate chips and Himalayan Pink Salt. Place in fridge for about an hour. Heat oven to 375 degrees. Take the log out of the fridge and slice the cookies. I like this cookie really crunchy as I think the crunch plays nicely with the black pepper and the salt. If you like a chewier cookie then just slice thicker. Bake for about 10 minutes. Try it both ways, cook just one or two slices and taste test. After all, testing is what it's all about! Let me know how you like the salt! An 81 year old and a beer filled boot!